It’s on the shelves at last! 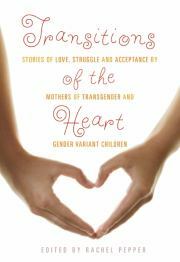 This new book, edited by Rachel Pepper, is a collection of writing by mothers of transgender and gender variant children (of all ages). I am honored to be one of the contributors. I have been waiting to get a copy – not just because I was excited about my own first instance of book publication – but also because I felt hungry to read what other mothers have written. You see, I’ve been emotionally very much on my own as a parent these last few years, and there has been no one to really share anything with. I deal with all the milestones (and most of the small matters) in isolation, including the very great and important one of my oldest son’s transition. So, I sat down and read the book from cover to cover yesterday afternoon. And my hunger was appeased in some ways, and heightened in others! Now I want real community, real people, to talk with on a more regular basis. There are many reasons for this. The elements of my unconventional family life is one of them. Not knowing any other parents of trans kids personally, except for the parents of my son’s fiance, is another. But I can’t really review this book – I am too close to it. So here’s one I found at Kirkus. I hope Rachel Pepper begins to collect writing from fathers and other family members too. That would make a great follow-up to this book. Truly. In the meantime, if you are in the SF Bay Area, come to the June 6th book party and reading at Books, Inc., 1760 – 4th Street, Berkeley, at 7 PM. I’ll be there, along with some of the other contributors. I hope to see you there too! Previous Previous post: Ending Violence and Hate Against Transgender People. Now.